If everyone is raising awareness, why don't veterans stop killing themselves? Isn't that a fair question? Isn't that a question all of us should be asking? There is another question that all of us should be, not only asking, but getting an answer to; What good are they doing for veterans? It is easy to talk about how much someone cares but a lot harder to care enough to know what will help. Then they need to be willing to do it as well as prepared to do it. Ok, confession time. A few weeks ago I had yet one more frustrating conversation with a local charity for veterans. It turned out they were not doing the work, but sending veterans to others to do the work. Top that off with only selected veterans and their families were welcome. The OEF and OIF veterans mattered enough but the majority of our veterans didn't. When I asked them if they were aware of the fact that 65% of the veterans committing suicide were over the age of 50, the answer was "yes" but they were not willing to do anything for them. So why are the majority of the veterans being neglected? Or should I say, rejected, simply because they were here longer? Are you still writing checks to these new groups when your husband is part of the forgotten majority? Are you passing on links on Facebook to them instead of groups helping your family? Do you honor all our veterans or just some of them? Have you even thought about that? The results are these groups with selected attention have ended up getting in the way of veterans discovering they do have the hope of healing and are not stuck where they are. Seems like that would be a beneficial message to share with them. So what good are you doing our veterans? Do you find out what is really helping and who is doing the work or settle for what is popular? Raising awareness, whatever that is supposed to mean, is very popular and all kinds of stunts are being pulled all across the country. The problem is, no one in the media pushing these stories bothered to review the outcome. Matthew 11:29-30King James Version (KJV)29 Take my yoke upon you, and learn of me; for I am meek and lowly in heart: and ye shall find rest unto your souls.30 For my yoke is easy, and my burden is light. We, however, review the outcome on a daily basis when we read about veterans taking their own lives after surviving combat. We read about the families left behind. I don't know about you, but every time I read one, I think about how my husband is still here and how close we came to that not happening. I think about his nephew who lost his battle over a decade ago and how I could not find a way to help him. I couldn't even find the right words to get him to hear me. I think about the lives saved over the years and then I get even sadder because this work is not glamorous, or expensive or even publicized because that is the way it needs to be. I just get sad knowing so many others could be doing the same work but do not bother. 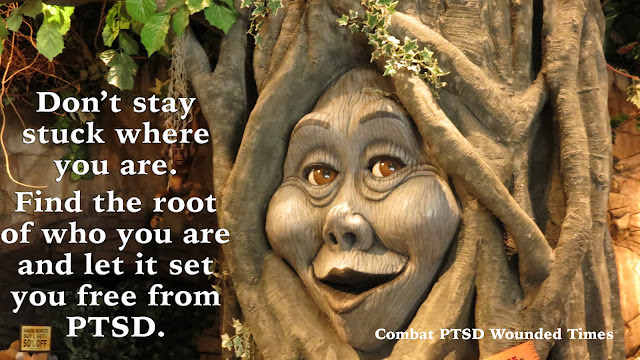 If you really want to help them, then help them find their roots. Who they were is still in there beneath the pain of how they are right now. If you want to do more than just talk about helping veterans, then do it! Be part of the help that has been going on since 1984 for all generations of veterans, Point Man International Ministries. We talk a lot about Veterans Courts operating now as good for them. It is the basis of how Point Man started when a Vietnam veteran/Seattle police officer, noticed he was arresting too many Vietnam veterans and he decided to do the work and help them. Support group that are taking care of all generations. Look them up online and read their mission statement. Don't write a check to selective groups if you want to help all generations. Find out what they claim to be needing the money for. Ask questions before giving support to any group. If they do not, or will not, answer your questions, then let others know what you discovered. The press will has shown no interest in doing it, so it is our job! We cannot set them free from PTSD controlling their days unless we are willing to give hours digging them out of the trench.